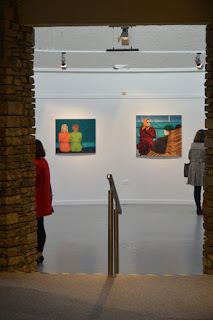 'Observances' by Nuala O'Sullivan part of the 'Gallery Interlude Series' at Lucky Lane, Limerick, with Contact Studios Opening 21 September, 2018. This exhibition of my work opens on Friday September 21st at 7.00p.m. and continues on Saturday 22 from 11am to 5pm, Sunday 2 - 4 pm, and Monday 11am to 3pm. 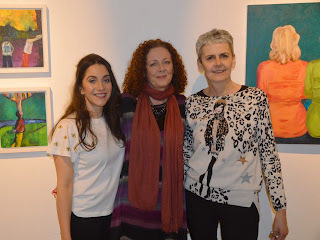 Some of the women from the 'Observances' Exhibition opening Friday. 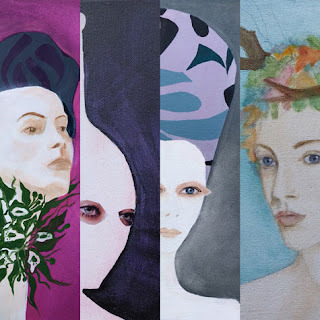 This work as ever uses memory as a starting point with women in a 'situation'. The title 'Observances' comes from both the restrictions, in terms of rites and rituals, women in particular were required to observe in the past, and also from the notion of their being under observation and scrutiny. The person behind the Gallery Interlude Series is Carl Doran, the Chairperson of Contact Studios. Through his contact with Mark Sheehan and Dave Irwan, both musicians, they have made a space available to show work, with occasional exhibition, at Lucky Lane, Limerick. A great venue and a great shop! Ger Callanan of the Glen Tavern has also sponsored the project and The Bigger Picture Framing Service offers a discount deal on works bought at the show. Many, many thanks to them all. These events help remind the public that Contact Studios are still in search of a city venue to operate from and that they have not gone away. Thanks especially to Carl for all the organising, Bella for her advice and help with hanging and Ciaran for the most wonderful poster. Also, I would like to acknowledge Limerick City and County Council for the use of my space in Cappamore. New home for my painting at Northern Trust Limerick. I'm so pleased to see my painting finding a new home at Northern Trust, Ballysimon, Limerick. This company has a large workforce from the Limerick area, and has expanded to new offices in Ballysimon, Limerick. 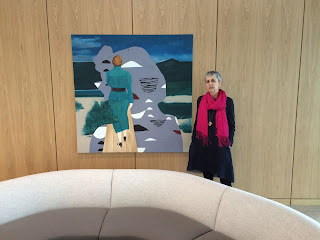 My painting was chosen following a selection process and its wonderful to see it sited in the foyer of this building. Many thanks to Northern Trust for their support. Truth or Dare at Siamsa Tire, Tralee, Co. Kerry. Exhibition runs until the 4th May, 2018. Truth or Dare is a group exhibition which shows work by myself, Suzanne Mortell and Grace Roberts. We all attended LSAD together and this is the first time we have shown our work together. 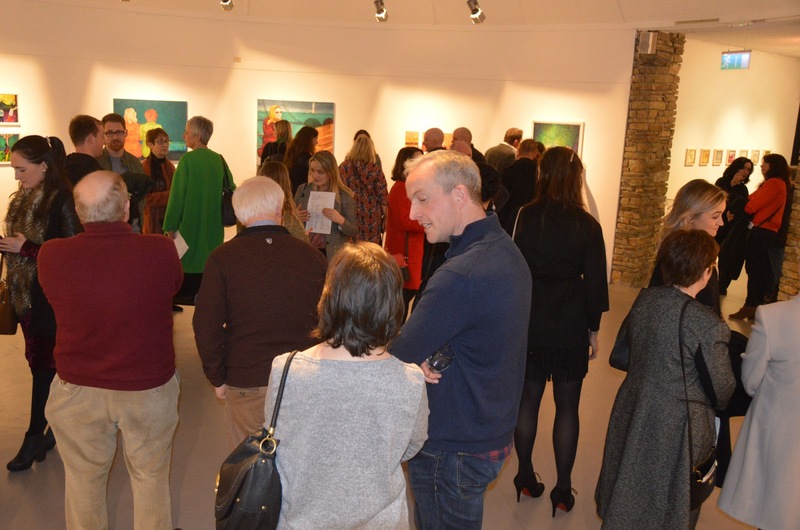 The exhibition was opened last Friday evening and runs until the 4th May, 2018. 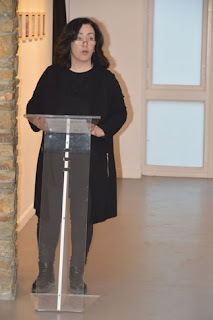 Catriona Fallon, CEO of Siamsa Tire, Tralee, gave a very thoughtful and perceptive opening address. It was obvious that she had put lots of care into her chosen words and for this we thank her. It was a wonderful evening in Tralee with so much support from friends and family as the following photographs show. 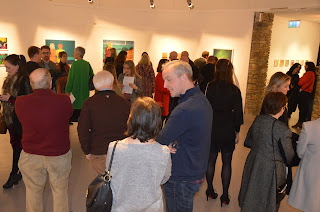 Some of the large attendance on the night. Thanks also to Catriona, Siamsa Tire CEO, for her curation advice on the layout and to Jimmy for his expertise in hanging the work. It has been a pleasure from beginning to end dealing with Siamsa Tire. Many thanks to Ballina Art Centre in Mayo for hosting my exhibition. 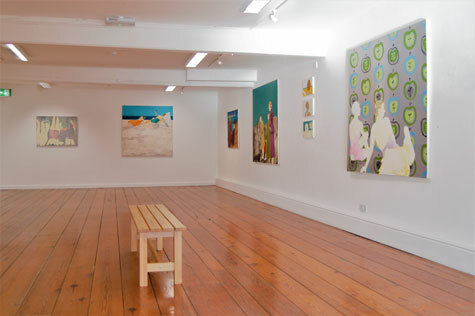 Its a wonderful space to show large scale work in. 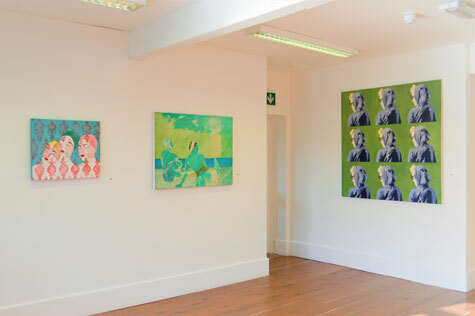 Gallery view of some of the work in situ. 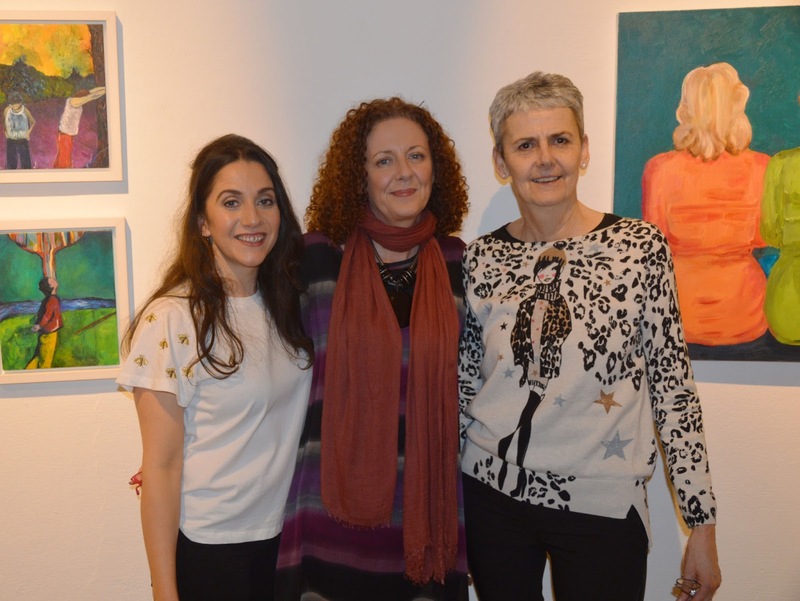 Photographs with thanks from Ballina Art Centre. Limerick based artist whose work investigates themes of identity and public persona through the media of photography and painting. 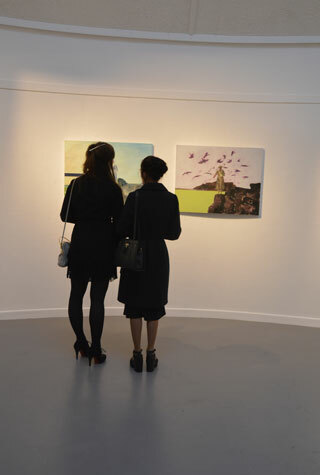 I am a visual artist based in Contact Studios Limerick. The concerns addressed in my work are my own perspective and interest in the role and status of women in society in the 1950s. The aesthetic and culture of that period have strong visual resonances for me. Found or family photographs, from an archive of photographs I have built up over many years, are the source material for many of my paintings. I also use photography to address more contemporary subjects in my practice.